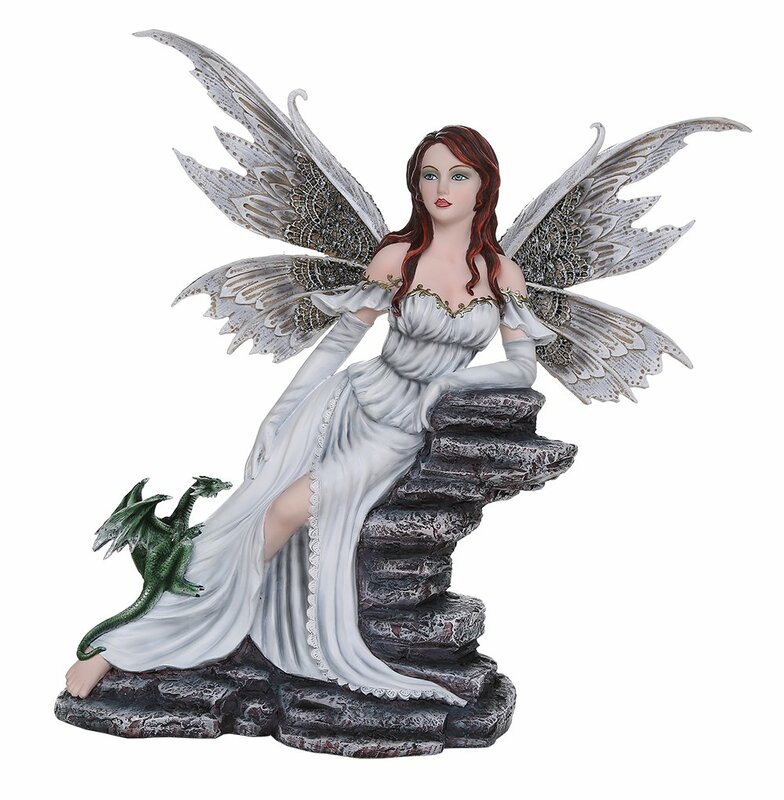 The detail and lavish design on fairies and dragons figurines can make for wonderful gift items that are ideal for those in love with all that is mythical. 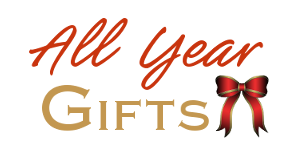 They make beautiful gifts to give to those who love this beautifully Gothic style. 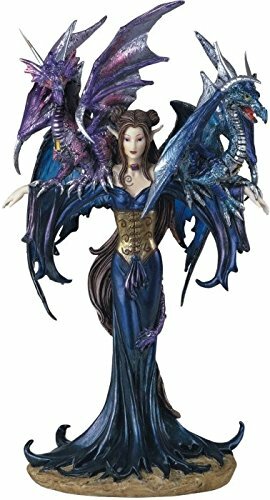 With beautiful dragons and fairies in a keepsake figurine format, you can create your own little fantasy world with a display right in your own home. These detailed collectibles and small sculptures can really adorn a plain shelf or area of display and give it a real focal point that you and other people can really enjoy looking at. 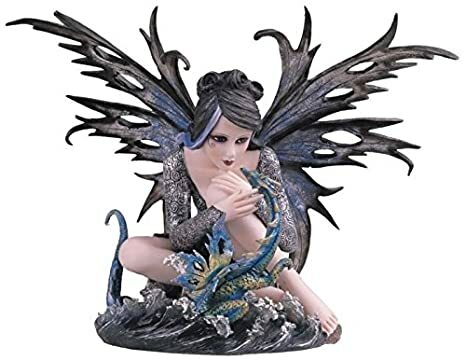 ⭐ Whether you prefer dark fairies or cute ones, you'll see a great range of fairy and dragon figurines shown right on this page for you. Some of these beautiful winged pixies are shown posing with baby dragons while other ethereal fairy creatures are dragon riders. They share a unique bond which is displayed in every single sculpture. 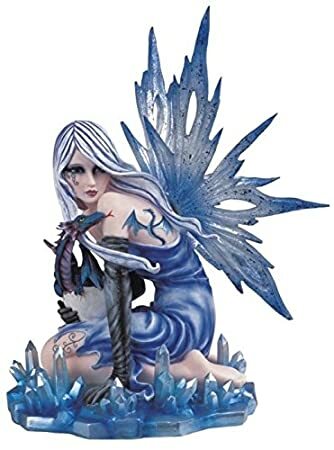 If you love midnight blues and purples then this is surely the Gothic fairies figurines statuette for you. This striking 10 inch figurine is commanding with the pose of the fairy who is holding out both arms with a dragon pet perched on top of each one. The fact that this piece combines not one but two dragons should be even better as far as fans of magic, the mystical world and fantasy are concerned. The fairy's amazing looking dress is in a shimmering midnight shade of purple and it is cinched in at the waist with a gold colored corset. The fabric skims over her thighs and works along the contours of her slim form before flaring out at the bottom rather dramatically to offset the dragons at the top. There are two dragons who are shaded in slightly differing tones. One is in a purple and pink coloring while the other is in purple and blue shades. I like the duality aspect of one feminine dragon and one masculine one. They are twin dragons yet they are not identical. It's a tall and commanding looking statue piece that should grace a display and steal the limelight away from any other figures that are on show. 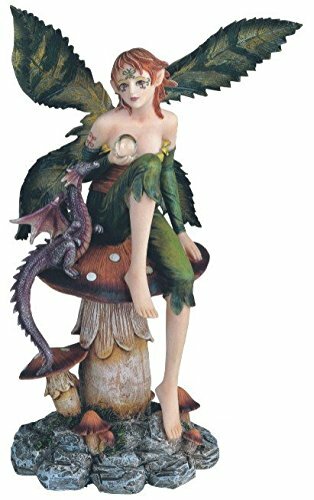 For a figurine more attuned to nature, what about this suggestion of a beautiful woodland fairy with her baby dragon sitting beside her. This fantasy wood pixie or enchanted elf looks like she is straight out of the lush Ireland countryside. She looks very Irish with her green clothing, wings and her reddish brown hair. This is the piece that appeals to me the most since my special color is green and I am drawn to all things natural. The setting in this figurine has been given much thought with the mushroom and toadstool seating that looks like it has been plucked right out of a magical wood. The fairy is holding a crystal ball and she is looking towards you as if she knows exactly what your future holds. What will she tell you? Look a little more closely and you may discover what it is. Jasmine Becket-Griffith is well known for her fairy and dragon art. 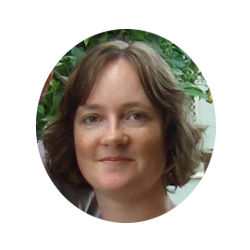 She works under the name of Strangeling and you can find her on sites such as eBay and Zazzle. Some of her paintings have been made into sculptures too. 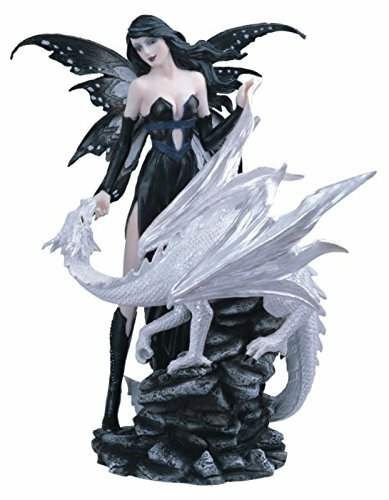 Here's a classic looking dragon rider fairy dressed in black so she stands out from the glistening white snow diamond dragon. This is a classic and classy combination with the black and white. Despite the pixie figure being dressed in black, she is not a dark fairy because her facial features are too soft. She is highly feminine and perched elegantly next to her beautiful white dragon. The relationship between this rider and her dragon friend is a close one since she is gazing at him adoringly. This is a special partnership between the pair and akin to something that you would read about in Eragon with the bond between Eragon and Saphira being such a close one. In the same range, there is also a ruby red fairy with her red and gold colored dragon are going to stand out among your collection of fantasy figurines. The pixie fairy has translucent wings which glisten when they catch the sunlight. Her dragon is protectively wrapping its tail around the base of her skirt. The dragon is colored in reds, golds, purples and blues and both complements his female counterpart as well as stands out from her form as well with his underbelly which is picked out in a glistening gold design. Red dragons happen to be my particular favorite because of the Hobbit dragon, Smaug. This one does not disappoint. An ornate statuette like this will look good displayed on its own or as the centerpiece of a larger display. The colors alone and the way the figurine shimmers will ensure that it commands the attention of anyone glancing its way. 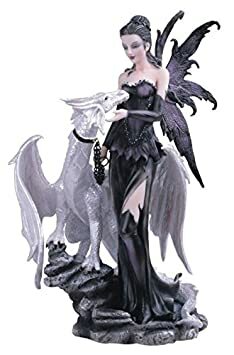 A softer and more feminine fantasy figurine is a sweet fairy sitting on top of a crystal ball along with her baby dragon pet. 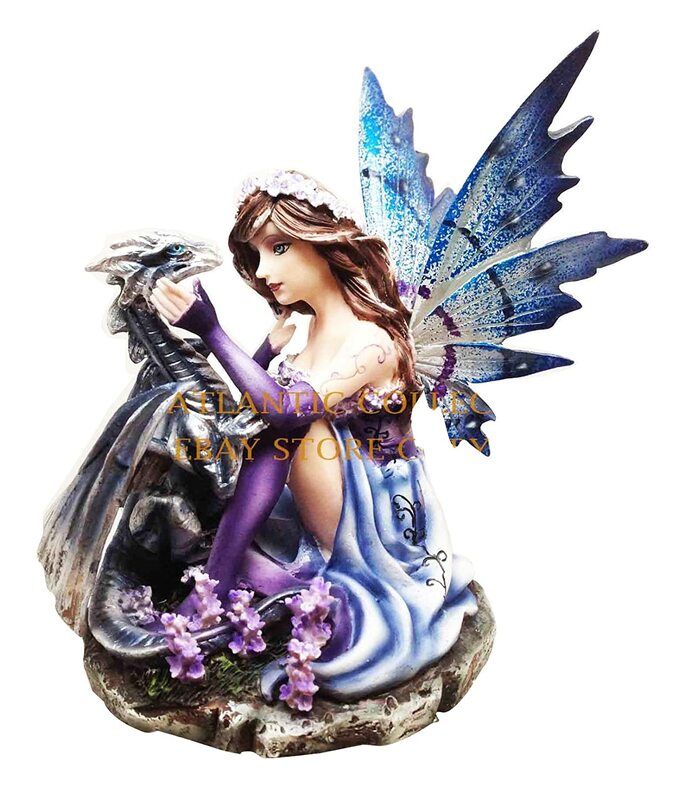 This amazingly detailed fairy is dressed in purples, magenta and lilac colors. The addition of the crystal ball adds to the magic and mystery of this detailed statue. You can imagine spending a lot of time staring into its depths and seeing if you can predict the future or make sense of the past. Her wings are in an extravagant 3 tiered formation with lots of scroll designs to complement the scroll-work patterns along her corset dress, her long gloves and around her purple clad legs. She looks like she is from an elegant and ornate ballet. This piece would make a wonderful gift for a girl who is into fantasy designs or someone who loves charming and feminine designs. The decoration should complement soft colors in a room. If you love escaping into your own little world of magic and fantasy, having a collection of stunning and ethereal legendary figures and characters on display can help to transport you there in a moment. Fairies and dragons are a popular theme for a fantasy fab and make wonderful keepsakes and gifts that can be treasured. Enjoy choosing something you love to gaze at.